Excuse the final dorky picture of me smiling about something- I look mid-blink/sneeze, but I think I was just looking off to the side! I keep thinking that my pictures look quite moody, but I’m actually quite a smiley person (/I pull a whole host of weird faces, but that’s something you’ll have to see another time! Aha), so I thought I should show that with a couple of pictures here and there. These pictures were taken when I popped by Somerset House on day 3 of London Fashion Week, when I was lucky enough to catch up with the lovely Portia, and she got some snaps of my outfit. I would strongly recommend that you check her work out, as her photographs are always seriously beautiful! I recently rediscovered Twin Peaks- it made me realise that I need more earthy tones (especially plaid) in my wardrobe, along with brogues, faux fur, and retro hair. I guess that explains the rest of my outfit here (I don’t own any brogues at the moment.. I’m on the hunt for the perfect pair!). I didn’t think the faux fur through really, I just had this image of an awesome Twin Peaks crossed with the 60s-esque outfit, but I ended up being really warm most of the time, doh! Sensible outfit planning has never been my forte though, if we’re being honest. Anyway, I hope you are all well, and having a lovely week! Sorry I haven’t been blogging for a little while, work has been absolutely crazy, with fashion week just adding to that. However, I have quite a few posts in the pipeline, so I shall be back to regular updates (yay)! Next Post Velvet & Pleats. You look gorgeous, forever envious of your hair. 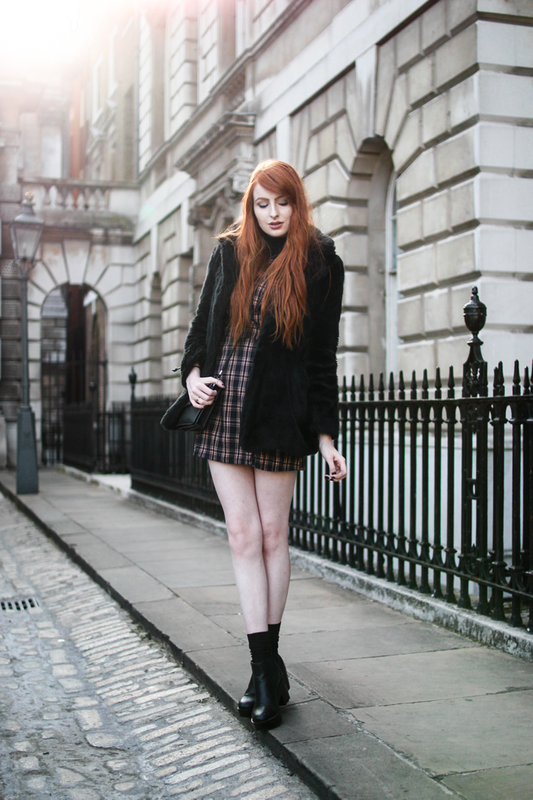 Awesome look, seriously in love with faux fur coats atm! Great outfit, I have followed you with Bloglovin and GFC and if you ever get the chance to check out my blog I would be delighted, thanks! You look incredible, as ever, MAJOR hair envy! Thank you so much for the super lovely comment on my blog, it seems pretty insane as I used to fangirl over you on Lookbook haha!! Awesome look as always! It's getting colder now, so I'm on the hunt for the perfect outerwear and I just got a trench coat, but now I really want one of those furry jackets! You look super cute ! Love how you wear the boots with the socks ! the outfit is very london-esque, with the plaid dress and fur coat. i love it! You look great and the pictures Portia took really are stunning, very professional and great lightening! Love your outfit! Amazing style. Perfect outfit ready for Autumn! I want that furry coat! Can you believe I'm still in Summer wear! I do like this for the Autumn, you look so comfy. Your dress is beautiful on you but your gorgeous hair! such a lovely shade of red, so eye catching! Gorgeous outfit. Your hair looks incredible!